After reading John Brosnahan’s will, I was curious to know what was in his father James’s will. I hadn’t found it on Archway when I initially looked, as I was searching under the name ‘Brosnahan’. Remembering that John’s parents were buried under the name of Brosnan, I searched again and found the reference to James’s probate file, held at Archives New Zealand’s Christchurch office. The office now offer to email you a PDF of the document(s) you are wanting, or you can wait for a photocopy by post (NZD20.00 charge which includes postage and up to 80 pages). Service was speedy and friendly! I, James Brosnan of the Levels Plain in the Provincial District of Canterbury in the Colony of New Zealand Farmer do hereby revoke all former Wills and Testamentary dispositions heretofore made by me and declare this to be my last Will and Testament I appoint George McSheehy Gentleman of Temuka in the Provincial District aforesaid Saddler and John Fitzgerald of Arowhenua in Provincial District aforesaid Farmer (hereinafter called “my Trustees”) to be the Executors and Trustees of this my Will. I devise my freehold sections numbered 8037 7763 and 15176 situated in the District of Timaru and section numbered 1207 on the plan of the Town of Arowhenua and all other lands and hereditaments of which I shall die possessed to my Trustees To the use and intent that my wife Ann Brosnan may receive out of the rents and profits thereof during her life a yearly rent charge of ten pounds sterling to be paid by equal half yearly payments the first of such payments to be made six months after my decease and to the further use and intent that if and as often as the said rent charge or any part thereof shall be in arrears for twenty one days my said wife shall have the same remedy by distress upon the said hereditaments ann premises for recovering such rent charges as lessors have by law for the recovering of rent in arrears And subject to such rent charge and the said remedy for the recovery thereof In trust as to the said section 1207 for my daughter Ann Brosnan her heirs and assigns forever and as to all other lands and hereditaments of which I shall die possessed in trust for my said daughter Ann Brosnan during her life and after her decease in trust for my grandson John Joseph Brosnan the son of my son John Brosnan his heirs and assigns forever I bequeath all the residue of my property to my trustees in trust to convert the same into money and to pay thereout my debts and funeral and testamentary expenses including the costs of erecting a gravestone over my grave and out of the residue to pay to my said wife the sum of twenty pounds to my daughter Kate Gaffaney the sum of forty pounds and to my daughter Margaret Gaffaney the sum of twenty pounds and to divide the residue equally among all my children who shall be living at my death And I declare that the power of appointing new trustees conferred by the Trustee Act 1883 may be exercised without the consent of any beneficiaries under this my will who shall at the time of such appointment be infants for under any disability In Witness whereof I have hereunto set my hand this seventh day of August one thousand eight hundred and ninety. There is no specific bequest to his daughter Ellen or son John – perhaps they were well set up anyway? And maybe he left his farming land to John Joseph as he was the youngest grandson, and without any land of his own? As for his trustees, I know John Fitzgerald was a close family friend but I have no idea who George McSheehy Gentleman was. I’d also love to get my hands on some contemporary maps that show the land sections. James’s will is dated 7th August 1890, and he died just over a month later, on 23rd September. Amanuensis Monday is an ongoing series at GeneaBloggers. An Amanuensis is a person employed to write what another dictates or to copy what has been written by another. James Brosnan Will, 1890; Probate file, 01 Nov 1890, Supreme Court, Canterbury District; PDF, from original Ref [CH171, CH1974/1890] held at Archives New Zealand, Christchurch. I’ve been filing! I haven’t done much else, just placed documents, notes, booklets, etc into clear plastic pockets and filed them in the relevant folder. I still need to process a lot of it, but at least it’s filed away. And it was interesting to come across a few things I’d completely forgotten about. Like a photocopy of an old photograph, with some names inscribed. I posted the photograph for a Wordless Wednesday post a while back, but didn’t know who most of the people were. On my trip to New Zealand in February, my father gave me the photocopy of it with the names, and I’d squirrelled it away rather than filing it properly. Left to right, standing on lawn: Minnie Gaffaney, Annie Gaffaney, Francis B. Early (Michael & Margaret’s son-in-law), Annie Fitzgerald (friend), Leo Gaffaney, Michael Gaffaney (father), Lucy Gaffaney, Susan Gaffaney. 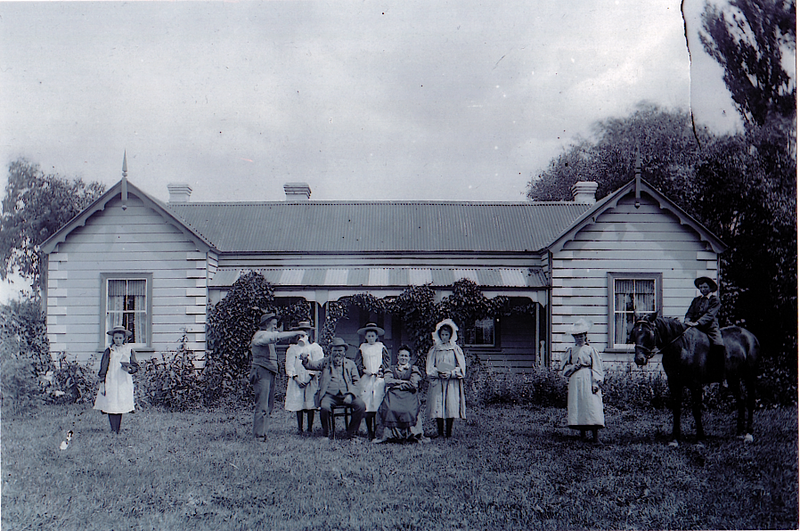 Left to right, standing on verandah: unknown, Margaret Gaffaney (mother), unknown, Annie Brosnahan (Margaret’s sister). What I noticed about the photos, is that my great great grandfather Michael is being poured a drink (of what?) in both! Was it some kind of family tradition or long-running joke, or maybe just pure coincidence? …the young couple having to visit Christchurch to get married. They travelled by coach, and the reason they had to go to Christchurch was that it was only twice a year a clergyman visited South Canterbury. Gaffaney, Michael & Margaret (Brosnahan) photograph, date unknown; digital image; scan from Gaffaney family papers, 2006, supplied by [NAME AND ADDRESS FOR PRIVATE USE]; original privately held by [NAME AND ADDRESS FOR PRIVATE USE], great grandson of couple. New Zealand, marriage certificate for Michael Gaffaney and Margaret Brosnahan; 26 Dec 1863, Christchurch; citing 1863/927, Birth, Deaths & Marriages, New Zealand. [NAME FOR PRIVATE USE], Gaffaney Family Tree, GEDCOM file supplied to [NAME FOR PRIVATE USE], New Zealand, c.2002. NZ Dept of Internal Affairs, “Death Search,” database, Births, Deaths & Marriages Historical Records (https://www.bdmhistoricalrecords.dia.govt.nz/search/ : accessed 2010), entries for Susan Gaffaney (1954/26926), Annie McCallum (1937/27027), Margaret Halley (1946/29610), Ellen Gaffney (1889/5177), Thomas Gaffaney (1900/1426), Kate Early (1947/31561), Michael Gaffaney (1915/6780), James Gaffaney (1967/45590), Peter Gaffaney (1954/32898), Mary Barron (1939/15425), Lucy Gaffaney (1952/26370), Joseph Gaffaney 1946/33165), [Beatrice] Theresa Gaffney (1888/4557), Leo Gaffaney (1963/32342). NZ Dept of Internal Affairs, “Marriage Search”, database, Births, Deaths & Marriages Historical Records (https://www.bdmhistoricalrecords.dia.govt.nz/search/ : accessed 2010), entries for McCallum-Gaffaney (1906/5299), Halley-Gaffaney (1900/5738), Early-Gaffaney (1892/3565), Gaffaney-Coughlan (1905/6513), Gaffaney-Leary (1910/5144), Barron-Gaffaney (1906/5298), Gaffaney-Hailes (1922/3983). New Zealand, marriage certificate for Peter Gaffaney and Margaret O’Rourke; 09 Nov 1909, Napier; citing 1909/7835, Birth, Deaths & Marriages, New Zealand. Another of the pioneers of the district, Mrs Margaret Gaffaney, passed away early on Tuesday morning at her residence, “Belper House”, Arowhenua, at the ripe age of 83 years. The deceased lady and her brother left London for New Zealand in the year 1862, travelling in the shop “Achenga” [sic], and landing by the surf boat at Timaru on Anniversary Day, December 16th. She was then Miss Margaret Brosnahan, and her parents, brothers and sisters, arrived about two years later. A year later, Miss Brosnahan married the late Mr Miichael [sic] Gaffney, the young couple having to visit Christchurch to get married. 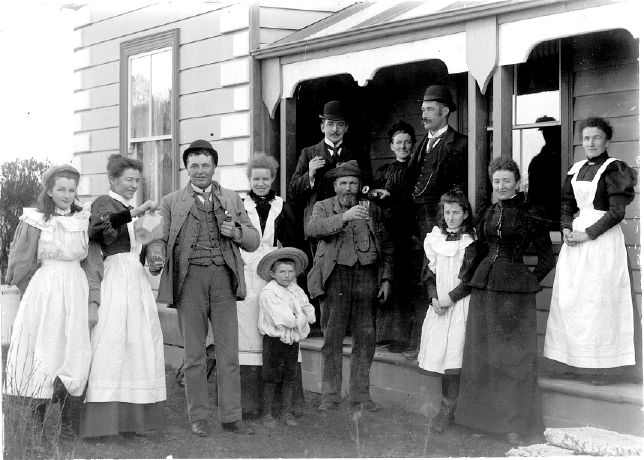 They travelled by coach, and the reason they had to go to Christchurch was that it was only twice a year a clergyman visited South Canterbury. 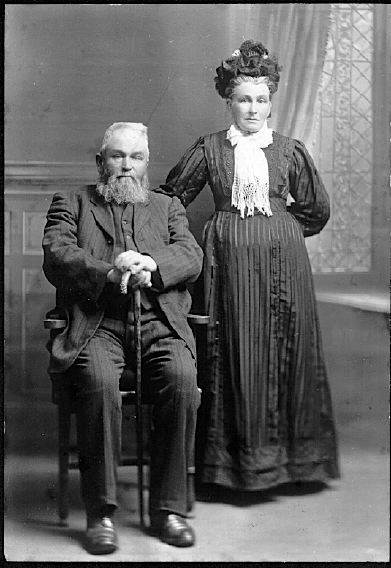 Mr and Mrs Gaffaney then returned to Temuka, and went to reside on the farm which the late Mrs Gaffaney occupied to the time of her death, her husband having predeceased her 16 years ago. There were fourteen children, of whom ten survive: Mr James Gaffaney (Levels), Mr Peter Gaffaney (Waimate), Messrs Joseph and Leo Gaffaney (Arowhenua), Miss Gaffaney and Miss L. Gaffaney (Arowhenua), Mrs W. Hally (Temuka), Mrs Barron (Arowhenua), Mrs Early (England), and Mrs R. McCallum (Timaru). There are 17 grand-children. Miss A. Brosnahan, of Timaru, the late Mrs Gaffaney’s sister, is the last of that Brosnahan family. Mr John Fitzgerald, of Arowhenua, was a shipmate of the deceased lady, and was best man at her wedding 64 years ago. The original newspaper clipping is held by my father, and I have a scanned copy, thanks to my brother. I’m not sure which paper it was from, possibly the Timaru Herald. Margaret Brosnahan is my great great grandmother, and I am descended from her son Peter Gaffaney.